BOSTON and HEATHROW, Fla. -- The average retail gasoline price for the 2018 Labor Day weekend will be about 20 cents per gallon (CPG) higher than the same holiday period last year, according to GasBuddy. As of Aug. 28, the national retail average for gasoline was $2.73 per gallon, GasBuddy said. The Boston-based fuel-price app provider expects the average to rise to $2.84 per gallon over the Labor Day weekend. 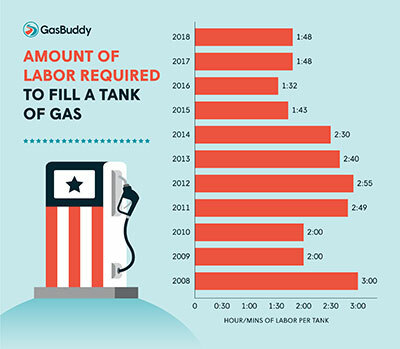 In an analysis, GasBuddy determined that, based on average wage figures from the U.S. Bureau of Labor Statistics, the average American would need to work one hour and 48 minutes to earn enough money to pay for a full tank of gas. This compares to summer 2014, when drivers would have to work two hours and 30 minutes to fill up with gas prices averaging $3.58 per gallon. And in 2008, it would take three hours’ worth of work to fill a tank at the summer average of $3.84 per gallon. Consumers have spent more than $1.11 billion per day on gasoline in summer 2018; this is the highest figure for the season since 2015, and significantly higher than the decade’s low of $912 million per day in summer 2016, GasBuddy said. The 2018 figure is not a high for the decade, however, and is in fact is the third lowest daily gasoline cost figure since 2011. Gas prices have moved relatively little this summer, with a shift of 13 CPG from the season’s low and high. This is the smallest difference in summer price lows and highs since 2010, GasBuddy said. Compare this to summer 2017, when the difference between the low and high was 29 CPG, and in summer 2016, which saw a 27-CPG difference. The most volatile summer for gasoline prices was summer 2005, when prices swung 91 CPG because of Hurricane Katrina. Heading into fall, the national retail average should decline to $2.70 per gallon or more, according to AAA, Heathrow, Fla. This figure is 14 CPG less than the national average Aug. 28, and 25 CPG below 2018’s high of $2.97 per gallon, set in May. This is also below the $2.90-per-gallon high that the national retail average hit for the July 4 holiday weekend, its highest point since 2014. AAA figures show that the year-to-date national average of $2.73 per gallon is 41 CPG higher than in 2017. The 10 states with the greatest year-over-year difference in their retail averages are California (57 CPG higher than in 2017); Hawaii (up 54 CPG); Indiana (up 49 CPG); Arizona (up 48 CPG); Oregon (up 46 CPG); Connecticut, Rhode Island and Utah, all up 45 CPG compared to a year ago; and Massachusetts (up 44 CPG).